Trekking through a dense forest of bamboo, sometimes for hours, seems daunting and maybe even a little crazy but the moment you catch your first glimpse of one of 900 remaining Silverback Gorillas in the world everything else just disappears. It will leave you in a rare moment of complete and utter “awe”. These animals, which are quickly becoming extinct, share an incredible 98% of our DNA. You might catch a glimpse of a mother cradling her infant much like a human would or a band lounging around enjoying each other’s company. The young are often chasing each other around causing mischief with the adults looking on in dismay. Don’t be shocked if one of the youngsters approaches your group, but be sure to hold still and do not touch these curious animals. This once in a lifetime experience is sure to leave you with incredible memories. These treks take place in three countries in Africa. The rain forests of Volcanoes National Park in Rwanda which offers a permit for $1,500USD per person. Virunga National Park in Congo with permits costing about $400 USD per person. In Bwindi Impenetrable Forest National Park and Mgahinga Gorilla National Park in Uganda permits cost about $600 USD per person. 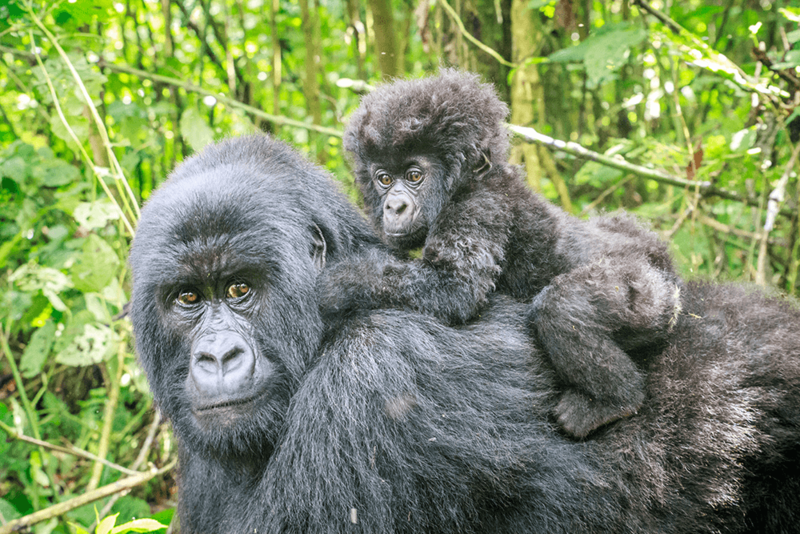 These journeys can take anywhere from 30 minutes to six hours to find the elusive gorillas. Wearing comfortable hiking shoes and long sleeve shirts and pants will ensure your trek is enjoyable. Since the gorillas live in the rain forest the best time to visit would be the dry seasons, June to September or December to February. Although, you can make the trek in the rainy seasons for a more adventurous and memorable experience. The age requirement for trekking is 15 and older. Even with a permit, anyone under 15 will be turned away. This is to limit the exposure of the gorillas to childhood disease such as mumps, chickenpox, measles, etc. These treks can take hours of hiking through mud and dense forests so we recommend that those whom wish to do the trek are healthy, in good shape and able to walk for a few miles without issue. Start with our Uganda and Rwanda packages and remember that they can be customized for your specific needs. Furthermore, please feel free to contact one of our travel specialist for more information or to book your gorilla trek!